I'm sorry I didn't have you over for a kitchen/dining room tour today. My allergies got the best of me and I looked and felt a mess. So, here's the deal...please stop by tomorrow morning for a tea party with me and Bono B. in our little kitchen. Also, tomorrow is the deadline for the National Poetry Month Giveaway. Lindsey, Bono Baby, and I will choose the winner tomorrow night and feature your entries. We can't wait to see who wins the Amazon gift card, Starbucks gift card, Amanda Atkins print, 2 signed poetry chapbooks and something pretty. This is HUGE friends..."don't put off being creative." p.s. I am in love with this print. I'm thinking we may need it for our next bathroom. 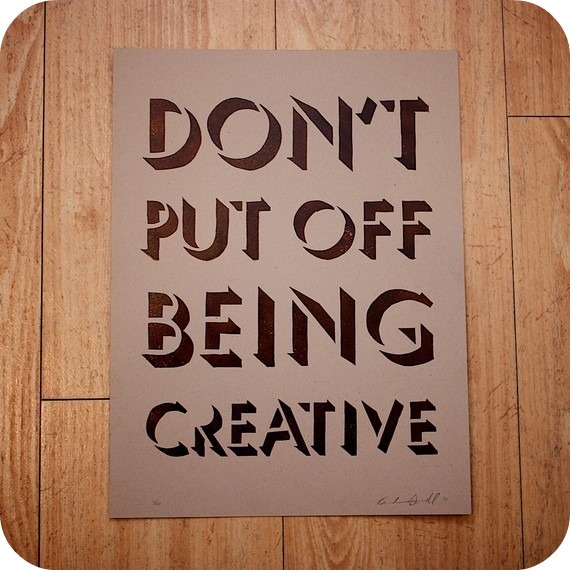 I know that sounds silly but isn't it the perfect place to be reminded to be creative everyday? I love that you love this quote. It spoke to me. Dan and I don't have cable but we do have Netflix. We've been thinking of putting it on hold for the summertime so we can focus more on our creative outlets. I think it is a lovely idea.